CHP officers chase a reportedly stolen semi-truck across multiple cities in the Inland Empire on Tuesday, Sept. 13, 2016. 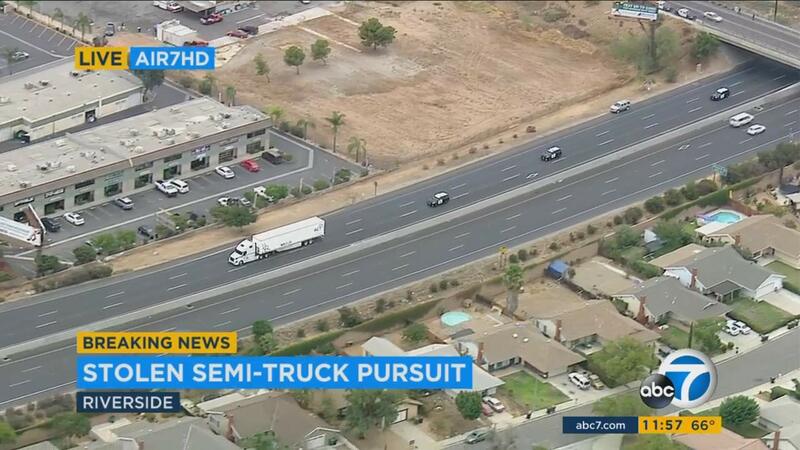 Police are chasing a stolen big rig in California. A driver in a reportedly stolen semi-truck led California Highway Patrol officers on a high-speed chase across the Inland Empire today. The incident began at around 10:30 a.m. in Apple Valley, where the driver failed to yield, according to San Bernardino County sheriff's officials. The suspect also drove onto the eastbound 60 Freeway, speeding through Gilman Springs and Beaumont, and then continued onto the 10 Freeway. The driver, who appeared to be alone in the cab of the truck, reportedly told police that he was not armed and that he doesn't want to go back to jail. The company name on the truck reads "ACT Enviro," a company that transports hazardous material. The company told Eyewitness News that it was not aware of the pursuit.